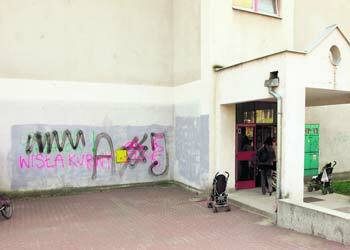 Gazeta Krakowska has already seen its first successes in painting over vulgar graffiti on the walls of local area schools. Under the supervision of police and municipal guards, detainees from the detention center on ul. Montelupich went to work yesterday. Their first target was Primary School No. 162 in Kurdwanów, where vulgar graffiti painted by football hooligans had been irritating the schoolmaster and parents alike. Municipal Guard Marcin Jurczenko told Gazeta Krakowska that they received 1500 złoty for paint from the magistrate at the Department of Education, supplies from the Krakow Board of Municipal Infrastructure and Transport (ZIKiT), and a delegation of prisoners from the detention center. He adds that in the next few days, they will be deciding which school will be next in line for a touch up.